Iraqi forces are closing in on the final few Daesh pockets in west Mosul. And many are awaiting for an official declaration of victory. Iraqi forces are closing in on the final few Daesh pockets in West Mosul. And many are awaiting for an official declaration of victory. TRT World's Sarah Jones reports. Iraqi forces are edging ever closer to finally driving Daesh fighters out of the last few streets under their control in the Old City of Mosul. But as the battle comes to an end, the impact on the civilians left behind is becoming clearer. TRT World's Nicole Johnston is in Mosul. A fierce battle is raging around Mosul's Grand al Nuri mosque, with huge numbers of civilians fleeing the intense fighting in the Old City. 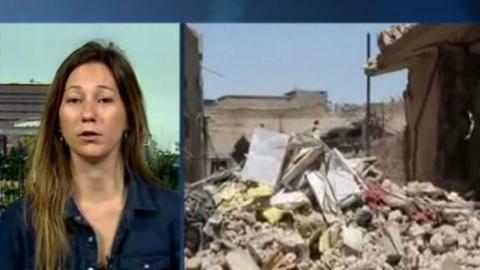 TRT World's Nicole Johnston has more from Mosul. More than 50,000 civilians, about half the Old City's population, remain trapped behind Daesh lines with little food, water or medicines, according to those who escape, Soraya Lennie reports. Over in Iraq, the military says they have stopped an attempted attack by a Daesh sleeper cell outside the Old City of Mosul. It comes as the Iraqi army pushes further into the heart of the city. Commanders say Daesh now controls just one square kilometre of Mosul. Iraqi troops launched the offensive to retake the city last October. Soraya Lennie reports. Residents flee as Old City is reduced to rubble and Iraqi PM says City's recapture to be announced soon. Iraqi forces have launched an assault on Mosul's Old City- the last remaining area held by Daesh. It marks the last phase of the US-backed offensive on Iraq's second largest city. Students are finally returning to Mosul’s university to resume their education after the Iraqi forces liberated many parts of the city from Daesh. TRT World’s Mikaela Barwick reports. The Iraqi army says the battle in Mosul is in its final phase even as Daesh intensifies attacks on the Western part of the city. The United Nations says more than 160 civilians were killed last week. Across the border in Iraq, government forces have launched an operation to recapture the remaining areas of Mosul held by Daesh. The US Defense Secretary James Mattis was asked about civilian casualties in the fight against Daesh on a national US news programme. Iraqi security forces are making a final push to retake the last parts of Mosul from Daesh. The campaign has been going for seven months... and now the fighting has reached the heart of the Old City. Christine Pirovololakis has the story. The military offensive against Daesh has resumed in Mosul after a one-day pause. The Iraqi military say they have captured two neighbourhoods from Daesh. Ben Said reports. Iraqi forces have detained hundreds of suspected Daesh members since the campaign to defeat the group started. Nicole Johnston's report from the Iraqi city of Kirkuk. Iraqi armed forces have made new gains in West Mosul, Nicole Johnston has more. The total number of civilians displaced from Mosul has risen sharply over the past days and exceeded 200,000 on Sunday, according to the International Organization for Migration (IOM). Nicole Johnston's report from western Mosul. People continue to flee their homes in Iraq as government forces battle with Daesh in western Mosul. Nicole Johnston has the latest details. US-backed Iraqi security forces took control of Mosul airport in a major step to drive Daesh out of western Mosul, Iraqi state TV said on Thursday. Ben Tornquist reports. The US-backed Iraqi-led coalition is battling to oust Daesh to gain full control of the airport and a nearby military base. Nicole Johnston from Erbil and Owen Holdaway from Mosul have more details. US-backed Iraqi forces are closing in on Daesh-held western half of Mosul as their latest assault enters its fourth day. Ammar Karim has more details.